Survivor HK-759 Fixed Blade Knife is the best self defensive tool which should be with you. 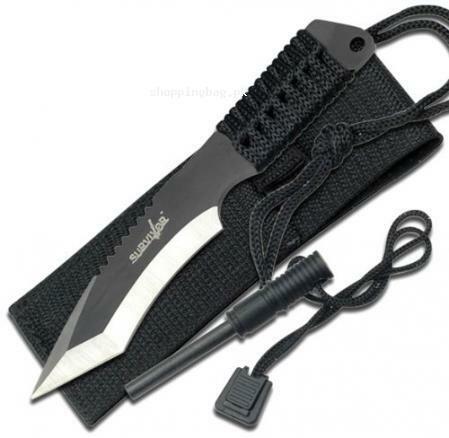 It is 7 inches in length and it comes with black corded sheath and handle. The knife is made from premium quality stainless steel and it is elegantly designed in black shade. You can keep it in your hand carry bag or in your car and ready to be the survivor. The blade is 2 toned and it is sharp enough to defend you in any emergency situation. It is the perfect survivor knife for the women who travel alone. Survivor logo is also printed on the blade of knife and it shows the originality of product. You can get Survivor HK-759 Fixed Blade Knife price in Pakistan from the facility of Amazon online shopping in Pakistan. Add the survivor knife to your cart and place your order now. You will get the Amazon imported products in Pakistan straight at your doorstep in the best delivery time. You can easily pay cash on delivery and have the Amazon products in Pakistan. Ensure your safety first with the best survival and defensive equipment then enjoy the life.